Glaucoma constitutes a broad group of diseases characterized by a common attribute of optic nerve degeneration and retinal ganglion cell (RGC) loss. Due to the multiple etiologies and varying presentations of glaucoma, it is occasionally difficult to identify the disease at an early stage. A glaucoma suspect is defined as a person who has one or more clinical features and/or risk factors which increase the possibility of developing glaucomatous optic nerve degeneration (GOND) and visual deficiency in the future.,, The objective of this review article is to present a practical approach to the diagnosis and management of such glaucoma suspects. Glaucoma suspects can be identified during routine screening of individuals for ocular or nonocular conditions. Red flags may come up during the assessment of patients who are referred for screening of diabetic retinopathy or those on medications, such as hydroxychloroquine, ethambutol, steroids, and others, to rule out drug-induced toxicities. They may also come to attention during screening of families with glaucoma or population-based studies related to glaucoma. Strong family history of severe glaucoma and other risk factors. The most common cause for individuals to be included in the category of glaucoma suspects is elevated IOP alone in the absence of other features of glaucoma. Sources of error during IOP measurement, such as uncooperative patients, tight neckties, uncalibrated tonometers, and other confounding factors should be excluded. Ocular hypertension (OHT) is defined as IOP >22 mmHg (2 standard deviations above the mean), but without any other abnormal features in the optic discs, VFs, or RNFL. In the absence of other features of glaucoma, if IOP is found to be consistently high on 3 consecutive examinations then, a diagnosis of OHT can be made. Therefore, the diagnosis of OHT is one of exclusion after ruling out any features suggestive of primary open-angle glaucoma (POAG). An individual with elevated IOP should be evaluated as any other glaucoma patient. Certain routine initial investigations which should be performed include serial IOP measurements; gonioscopy; optic disc photos (if possible, stereoscopic); central corneal thickness (CCT); and VF and RNFL thickness (RNFLT) assessments. Other investigations, such as ultrasound biomicroscopy, scanning laser polarimetry, and confocal scanning laser ophthalmoscopy, can be individually customized depending on their availability or indication. IOP should be checked on three different days at different times of the day so that any IOP spikes are not missed. The time should be recorded duly in the medical records to determine any diurnal fluctuation of IOP. Attempts should be made to obtain at least 3 VFs during the 1st year of assessment. Optic disc photos are also important since they are less likely to show change compared to VFs which might not always be reliable. RNFLT assessment is becoming common with the availability of optical coherence tomography (OCT) machines. OCT allows quantitative RNFLT measurements, as well as evaluation of ONH topography and macular thickness. Among these, RNFLT assessment remains the most reliable, even as a stand-alone parameter. In a study to determine and compare the diagnostic performance of OCT, stereoscopic disc photos, and VFs among a group of glaucoma specialists, it was found that OCT had better internal agreement as well as better agreement with the consensus of clinicians. Certainly, OCT is still far from perfect due to the acquisition and biological factors which can affect the interpretation of the findings. Whenever possible, both structural (OCT) and functional (VF) changes should be analyzed since one could precede the other. A combined evaluation of these parameters (Bayesian method) is more advantageous compared to individual analyses for the detection of glaucoma. Other imaging techniques for glaucoma are also available. They include confocal scanning laser ophthalmoscopy (e.g., Heidelberg retinal tomography) and scanning laser polarimetry (e.g., GDx Nerve Fiber Analyzer). Now, newer imaging technologies are on the horizon which could identify the presence or absence of glaucoma at the cellular level. One such technique is detection of apoptosing retinal cells technology which is being studied to diagnose the appearance of apoptosis as a primary event in glaucoma, before OCT or VF changes. A number of other imaging techniques such as swept-source OCT and OCT-angiography are being evaluated to improve the early diagnosis of glaucoma. IOP is an important parameter in the management of glaucoma since it is the only modifiable risk factor at present. The OHT treatment study (OHTS) found that high IOP alone can be a risk factor for the development of glaucoma. The OHTS reported that a 1 mmHg increase in IOP was associated with a 10% increase in relative risk of conversion to POAG. The study also found that a 22.5% decrease in IOP in treatment arm (vs. 4% in control arm) was associated with a reduction in the development of POAG from 9.5% in controls to 4.4% in the treatment group at 60 months of follow-up. Therefore, there is unequivocal evidence of IOP being an important risk factor for the development of glaucoma. It is also a common factor responsible for the overdiagnosis of glaucoma. Due to the perceived risks of high IOP and fear of lawsuits, individuals are often started on antiglaucoma medications, despite the absence of other features of glaucoma. Family history of glaucoma should always be inquired in cases of glaucoma-suspects. Epidemiologic and genetic studies have found a positive linkage of glaucoma with family history. The Baltimore Eye Survey reported that after considering age-adjusted associations of POAG with a family history of glaucoma, there is a 3.69 times higher risk of development of POAG in siblings than in parents (odds ratio = 2.17) or children (odds ratio = 1.12). Genome-wide association studies have also found a number of genes responsible for congenital and familial glaucoma, while no such consistent genetic association could be found in sporadic glaucoma. Glaucoma-suspects having a history of RVO should be regarded to have an additional risk factor. In a study by David et al., it was found that patients with increased IOP and/or glaucoma have a higher prevalence of RVO than persons with no history of elevated IOP. Occasionally, only splinter hemorrhages can be seen on the optic disc. In the absence of other factors such as hypertension or diabetes, these so-called Drance hemorrhages signify the appearance of focal disc damage and VF loss. Nonetheless, splinter hemorrhages can occur in other conditions such as posterior vitreous detachment, optic disc drusen, vascular occlusive retinal diseases, nonglaucomatous optic neuropathy, leukemia, and lupus. In the presence of disc hemorrhages in a patient with OHT, the risk of conversion to POAG increases by 6 times (by univariate analysis) and 4 times (by multivariate analysis). The Asia Pacific Glaucoma Guidelines mention that compared to a single episode of disc hemorrhage, recurrent hemorrhages increase the risk of optic nerve damage by 3–4 times. Refractive errors should be assessed in all glaucoma suspects. A number of epidemiological studies such as the Blue Mountains Eye Study, Barbados Eye Study, Beaver Dam Eye Study, Singapore Malay Eye Study, and others have shown a positive association of POAG with the increase in the degree of myopic refraction.,,, Conversely, other studies such as the OHTS did not show a significant relationship between the two conditions. In a review of high myopia as a risk factor for POAG, Chen reported that the link between myopia and increased susceptibility or progression to glaucoma remains controversial. Regarding hypermetropia, the Beaver Dam Eye Study had reported that such individuals have a 40% more likelihood to have OHT compared to emmetropic individuals at baseline. No such association was reported in myopic individuals. Studies have shown a higher prevalence of primary angle closure glaucoma (PACG) in hyperopic individuals, especially when above 2D., However, von Romunde did not find any statistically significant correlation between refractive error and PACG. Increasing age as a risk factor for the development of glaucoma has been identified in a number of studies. The Barbados Eye Study and Blue Mountains Eye Study found age to be a major risk factor for the development of POAG., The Advanced Glaucoma Intervention Study also reported a 30% increase in the odds for VF progression for every 5 years' increment of age. Since age is positively associated with a higher prevalence of glaucoma, it is recommended to screen all possible persons above 40 years of age for this disease. CCT was found to be a powerful predictor for the development of POAG in OHTS. The relative risk of POAG increased 81% for every 40 μ thinning of cornea. Both OHTS and the European Glaucoma Prevention Study found that the risk of developing POAG was greater in eyes with CCT <555 μ compared with eyes having CCT of 588 μ or greater. Another study has reported that patients with thinner corneas tend to have more severe glaucoma even on initial examination and have a higher risk of progression. The actual IOP can be overestimated on Goldman applanation tonometry in eyes with thicker corneas, whereas an underestimation may happen in eyes with less than average CCT. Refractive surgery can alter the corneal biomechanics and corneal thickness, thus resulting in falsely low IOP readings. However, in the presence of corneal edema IOP tends to be underestimated and is overestimated in over corneal scars due to the increased rigidity of fibrous tissue. It is therefore mandatory that all glaucoma suspects undergo pachymetry so that their IOP can be assessed in the proper perspective. It has not been verified if CCT is regarded as a risk factor because of its effect on IOP measurements or an independent risk factor unrelated to IOP. To overcome any errors, a number of algorithms have been developed to provide correction factors between IOP and CCT. Currently, no linear correction formula for the two parameters is available. In the absence of a universally acceptable formula, the World Glaucoma Association Consensus on IOP suggested that correction factors should not be used in individual patients. Furthermore, a study of East Asian individuals did not find any evidence of thinner corneas being an independent risk factor for the development of glaucoma. If possible, CCTs should be assessed for all glaucoma suspects, at least on the first visit, to obtain a baseline. Apart from CCT, other biomechanical parameters such as corneal hysteresis (CH) have been identified which could be related to the development and progression of glaucoma. Hysteresis is defined as the difference between the pressure at which the cornea bends inward from an airjet applanation and the pressure at which it rebounds again. This difference is used to assess a biomechanical property of the cornea related to its elasticity. CH was found to be lower in glaucomatous, compared to nonglaucomatous eyes. It was also reported that lower CH values were associated with progression of glaucomatous VFs, independent of CCT. Thus, CH may play a role in the assessment of glaucoma suspects, although so far its importance remains to be established. The ONH should be evaluated on slit-lamp biomicroscopy using appropriate lenses. The size of the disc is also a factor to be considered in the assessment of cupping. Large discs appear to have larger cups. When examining optic discs, the magnification factor of the condensing lens used for slit-lamp biomicroscopy should be taken into account. Abnormal cupping or an increase in the cup-to-disc ratio (CDR) is frequently associated with glaucoma suspects. Stereoscopic evaluation of the optic discs has shown a Gaussian distribution of the mean CDR at 0.4 with only an approximately 5% normal population having CDRs of 0.7 or more. A difference of 0.2 between the two eyes should be viewed with suspicion. Such a finding is present in only 1% of the normal population. Studies have shown that both cup and pallor enlarge slightly with age. However, the age-related enlargement of optic cup is gradual, compared with the more rapid progression of GOND. While in physiologic cupping, despite a high CDR, the sizes of the cups bilaterally are nearly symmetrical. Particular attention should be paid to the neuroretinal rim (NRR). The rim is broadest inferiorly among all quadrants, followed by the superior, nasal, and temporal rims (ISNT-rule). The loss of inferior or superior NRR leads to a vertical elongation of the cup and loss of the ISNT-rule leading to a suspicion of glaucoma., It should, however, be kept in mind that the ISNT-rule applies to normal sized discs only. In large optic discs, a large cup might be confused for GOND. In nonglaucomatous optic discs, despite a large cup, the NRR remains stable and healthy. On an average, non-glaucomatous black individuals African-Americans have larger disc areas and large CDR compared to whites Caucasians, although, a substantial overlap is present although a substantial overlap is present. Increased size of the physiologic cup may also occur as a familial trait or seen in conditions such as high myopia. While glaucoma is associated with an increase in CDR, it can also lead to increased pallor, but sparing the remaining NRR. Vascular causes are commonly associated with disc pallor. In the absence of other significant histories, previous episodes of high IOP may also cause disc pallor. Therefore, a history of acute momentary visual obscuration, redness, and pain in the eye has to be enquired. Glaucomatous optic atrophy shows certain characteristic features which help to differentiate it from physiologic cupping. 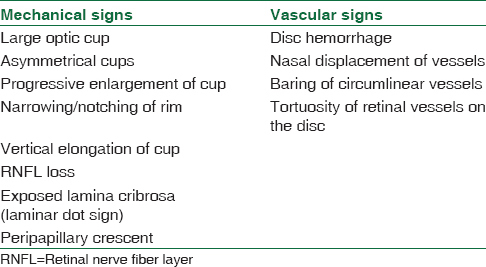 These mechanical and vascular signs seen in glaucomatous discs are given in [Table 1]. Stereophotographs of the optic discs are ideal to preserve the records of the patient for future reference. However, computerized digital images or even hand drawings may suffice, with the relevant details marked in the drawing. The mechanical and vascular signs mentioned in [Table 1] can be incorporated while recording the findings in the case notes. A number of imaging techniques have been developed to assess the RNFL. These include the confocal scanning laser ophthalmoscope, scanning laser polarimetry, and OCT. The last mentioned technique is most commonly used. It is a noncontact, noninvasive in vivo tool which provides high-resolution images of the RNFL, ONH, and macula. Glaucoma patients show thinning of the peripapillary RNFL, providing structural evidence of glaucomatous damage. Assessment of RNFL has been found to be extremely useful in glaucoma suspects, especially when differentiation from myopia or physiologic cupping is required. Changes seen on OCT can also be used as a pointer to anatomical changes in optic discs. A more diligent repeat examination of the ONH focused on OCT findings can reveal changes missed on an earlier inspection of the optic disc. However, in certain cases, measurement of RNFLT and ganglion cell complex may provide abnormal data which leads to a suspicion of glaucoma in the absence of other clinical signs of the disease. It should be remembered that false-positive findings can occur on OCT, a feature known as “red disease.” This is due to a lack of the acquired data in the normative database of the machine (e.g., in high myopia). Similarly, the machine may only assess normal areas, miss out the damaged areas of the retina and provide erroneously normal outputs in glaucoma patients. This is known as “green disease.” Therefore, single measurements of these parameters should not be regarded as diagnostic. The tests should be repeated over time to look for definitive changes from baseline indicative of glaucoma. Certain software in the OCT machine, such as the Glaucoma Progression Analysis, can be utilized to assess progressive disease. Progression analyses (progression event detection) are advantageous as they do not require normative databases needed for interpretation of OCT findings. It also obviates other confounding factors such as racial differences and differentiation from high myopes. Localized progression events which are repeated in two or more successive images are compared to baseline images (red events) to provide better diagnostic accuracy. Newer parameters such as the Bruch's membrane opening-minimal rim width have been found to have high association with glaucomatous functional changes seen also on VFs, and thus, have a better ability to detect early glaucoma. Consequently, it needs to be highlighted that undue reliance on newer glaucoma diagnostics leads to overdiagnosis of glaucoma when interpreted in isolation and without considering the complete clinical picture. VF assessment has traditionally been performed by automated static threshold perimetry utilizing the 30-2 or 24-2 programs. However, De Moraes et al. have recently reported that some glaucoma suspects may reveal central defects on 10-2 tests which are missed on 24-2 programs. Traynis et al. have also reported that as much as 16% of eyes with a normal 24-2 VF result show significant abnormalities on the 10-2 test. Macular VF defects found in glaucoma can range from arcuate scotomas to papillofoveal horizontal step (“pistol-barrel”) defects. In a symptomatic patient, the appearance of a VF defect should direct the examiner to the onset (date, circumstance, and associated complaints) and subsequent course of the symptoms. A VF defect which appears suddenly is unlikely glaucoma. In such cases, the examiner should rule out conditions such as anterior ischemic optic neuropathy. A visually significant symptom which was noted by the patient some time back and which seems to have worsened could be due to glaucoma, cataract, or a slow-growing compressive lesion. As perimetry remains a highly subjective test, on an average, 3 VF assessments should be done in the 1st year to detect an overall change in mean deviation of 4 dB over 2 years in a patient with average VF variability. Progressive VF loss is the hallmark sign which separates a true pathology from a glaucoma suspect. The VFs should be scanned for atypical features such as central scotomas (examine the foveal threshold value) and asymmetry across the vertical midline. Such abnormalities are usually not seen in glaucoma. The central scotomas can be assessed by Amsler chart testing and OCT should be done, if available. This will rule out any macular pathology. Slit-lamp examination should be done to look for trauma and conditions causing intermittent IOP elevations, for example, pigment dispersion or narrow angles. A dilated fundus examination should be done to rule out any retinal or macular scars which could produce VF defects. Other abnormalities such as subtle staphylomas or signs of previous vascular occlusion, for example, vascular attenuation, shunt vessels, and peripheral hemorrhages should also be looked for. Uniocular field loss not explained by obvious asymmetry or concurrent unilateral disease. Patients with narrow angles are prone for ACG. However, not all individuals with narrow angles develop such glaucomas. Unfortunately, provocative tests and population-based studies have not been able to accurately diagnose eyes susceptible to develop ACG. Patients with angle anomalies and angle recession should undergo annual reviews with measurement of IOP, gonioscopy, and VF assessment; to rule out any suspicion of development of glaucoma. Improper gonioscopy techniques can lead to misdiagnosis of the condition. Thus, the procedure should be practiced and mastered to avoid any procedural errors. A comprehensive review of the procedure is presented elsewhere. The management of patients with narrow angles is discussed further in the treatment section. At present, the treatment of glaucoma is limited only to control of IOP. However, in glaucoma suspects, occasionally measures can be undertaken to prevent the development of glaucoma. Depending on the risk category, IOP reduction can be considered, after discussing the condition with the patient. It is imperative to consider the possibility of progressive visual loss against the expected life expectancy, treatment-related side-effects, financial impact, and negative effects on the quality of life of the individual. Patients with low risk may opt for yearly monitoring of their condition. Conversely, those in the medium-to-high-risk category can be encouraged to have their review every 6 monthly or less, depending on clinical judgment. 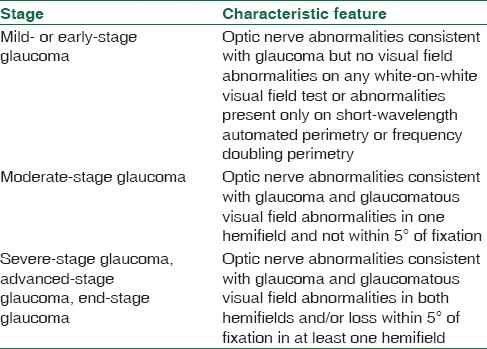 A grading scale of glaucoma patients is given in [Table 2]. Treatment can be started with a prostaglandin analog as they have to be instilled only once per day, have an effective IOP lowering capability and are devoid of significant side effects. Another possible option is to use brimonidine as it could have a neuroprotective capability. The single most important factor in the diagnosis of glaucoma is progression in the parameters. OHTS reported that 9.5% of the patients in the observation-only group progressed. Thus, 90.5% did not. Therefore, not all patients need to be treated. A 20% decrease in IOP should be tried first in the medium-to-high-risk individuals. Any patient with IOP above 40 mmHg should be considered at high risk and started on treatment to lower the IOP. Others consider baseline IOP of >30 mmHg an indication to start treatment. Patients with an IOP of >28 mmHg and CDR of >0.6 require treatment due to the high risk of developing glaucoma. However, in patients with IOP between 22–30 mmHg, other factors may need to be taken into account before starting treatment. Apart from topical treatment, argon laser trabeculoplasty (ALT) or selective laser trabeculoplasty can be used as alternative or additional therapy. The Glaucoma Laser Trial reported the effectiveness of ALT to be equivalent to that of treatment with timolol. Some studies have shown that cataract extraction alone may cause lowering of IOP. Cataract surgery can be combined with microincisional glaucoma surgery (MIGS) implantation to further reduce IOP. The advent of MIGS has provided another option to treat patients while conserving the conjunctiva for further incisional procedures if required in the future. Cataract surgery helps in an improved assessment of the optic nerve and RNFL. It also obviates certain errors associated with VF testing. As the duration between the cataract and a future glaucoma filtering surgery is prolonged, it reduces the risk of trabeculectomy failures. Increased cupping should be documented on serial examinations. To confirm the deepening/widening of old scotomas or appearance of new ones, repeat VF testing is required. Individuals with narrow angles can be considered for prophylactic peripheral iridotomy. The indications for this procedure are given in [Table 3]. Glaucoma suspects form a diverse group of individuals who pose a diagnostic dilemma. As the diagnosis of glaucoma is a life-changing condition, which can lead to depression and affect the quality of life of the individuals, caution should be exercised before labeling an individual with this condition. This article provides a feasible blueprint for the diagnosis and management of such glaucoma suspects. Nayak BK, Maskati QB, Parikh R. The unique problem of glaucoma: Under-diagnosis and over-treatment. Indian J Ophthalmol 2011;59 Suppl 1:S1-2. Topouzis F, Wilson MR, Harris A, Anastasopoulos E, Yu F, Mavroudis L, et al. Prevalence of open-angle glaucoma in Greece: The Thessaloniki eye study. Am J Ophthalmol 2007;144:511-9. Detorakis E, Symvoulakis E. Over-diagnosed glaucoma: Possible consequences for patients and health care services. Hippokratia 2011;15:381-2. Hodapp E, Parrish RK, Anderson DR. Clinical Decisions in Glaucoma. 1st ed. US: St. Louis Mosby;1993. American Academy of Ophthalmology. Primary Open Angle Glaucoma Suspect. Preferred Practice Pattern. American Academy of Ophthalmology; 2016. Chang RT, Singh K. Glaucoma suspect: Diagnosis and management. Asia Pac J Ophthalmol (Phila) 2016;5:32-7. Teng C, Gurses-Ozden R, Liebmann JM, Tello C, Ritch R. Effect of a tight necktie on intraocular pressure. Br J Ophthalmol 2003;87:946-8. Chauhan BC, Garway-Heath DF, Goñi FJ, Rossetti L, Bengtsson B, Viswanathan AC, et al. Practical recommendations for measuring rates of visual field change in glaucoma. Br J Ophthalmol 2008;92:569-73. Blumberg DM, De Moraes CG, Liebmann JM, Garg R, Chen C, Theventhiran A, et al. Technology and the glaucoma suspect. Invest Ophthalmol Vis Sci 2016;57:OCT80-5. Hood DC, Kardon RH. A framework for comparing structural and functional measures of glaucomatous damage. Prog Retin Eye Res 2007;26:688-710. Ahmad SS. An introduction to DARC technology. Saudi J Ophthalmol 2017;31:38-41. Tielsch JM, Katz J, Sommer A, Quigley HA, Javitt JC. Family history and risk of primary open angle glaucoma. The Baltimore eye survey. Arch Ophthalmol 1994;112:69-73. Aung T, Khor CC. Glaucoma genetics: Recent advances and future directions. Asia Pac J Ophthalmol (Phila) 2016;5:256-9. David R, Zangwill L, Badarna M, Yassur Y. Epidemiology of retinal vein occlusion and its association with glaucoma and increased intraocular pressure. Ophthalmologica 1988;197:69-74. Asia Pacific Glaucoma Guidelines. 3rd ed. The Netherlands: Kugler Publications; 2016. p. 18. Mitchell P, Smith W, Attebo K, Healey PR. Prevalence of open-angle glaucoma in Australia. The blue mountains eye study. Ophthalmology 1996;103:1661-9. Leske MC, Connell AM, Wu SY, Hyman LG, Schachat AP. Risk factors for open-angle glaucoma. The Barbados eye study. Arch Ophthalmol 1995;113:918-24. Shen SY, Wong TY, Foster PJ, Loo JL, Rosman M, Loon SC, et al. The prevalence and types of glaucoma in Malay people: The Singapore Malay eye study. Invest Ophthalmol Vis Sci 2008;49:3846-51. Chen SJ, Lu P, Zhang WF, Lu JH. High myopia as a risk factor in primary open angle glaucoma. Int J Ophthalmol 2012;5:750-3. Shen L, Melles RB, Metlapally R, Barcellos L, Schaefer C, Risch N, et al. The association of refractive error with glaucoma in a multiethnic population. Ophthalmology 2016;123:92-101. Dandona L, Dandona R, Mandal P, Srinivas M, John RK, McCarty CA, et al. Angle-closure glaucoma in an urban population in Southern India. The Andhra Pradesh eye disease study. Ophthalmology 2000;107:1710-6.
van Romunde SH, Thepass G, Lemij HG. Is hyperopia an important risk factor for PACG in the Dutch population? – A case control study. J Ophthalmol 2013;2013:630481. Nouri-Mahdavi K, Hoffman D, Coleman AL, Liu G, Li G, Gaasterland D, et al. Predictive factors for glaucomatous visual field progression in the advanced glaucoma intervention study. Ophthalmology 2004;111:1627-35. European Glaucoma Prevention Study (EGPS) Group, Miglior S, Pfeiffer N, Torri V, Zeyen T, Cunha-Vaz J, et al. Predictive factors for open-angle glaucoma among patients with ocular hypertension in the European Glaucoma Prevention study. Ophthalmology 2007;114:3-9. Herndon LW, Weizer JS, Stinnett SS. Central corneal thickness as a risk factor for advanced glaucoma damage. Arch Ophthalmol 2004;122:17-21. Kaushik S, Pandav SS. Measuring intraocular pressure: How important is the central corneal thickness. J Curr Glaucoma Pract 2007;1:21-4. Available from: https://www.eyedocs.co.uk/ophthalmology-articles/glaucoma/769-iop-and-corneal- thickness. [Last accessed on 2017 Jul 27]. Weinreb RN, Brandt JD, Garway-Heath D, Medeiros FA. Intraocular pressure. World Glaucoma Association Consensus Series-4. The Netherlands: Kugler Publications; 2007. Day AC, Machin D, Aung T, Gazzard G, Husain R, Chew PT, et al. Central corneal thickness and glaucoma in East Asian people. Invest Ophthalmol Vis Sci 2011;52:8407-12. Deol M, Taylor DA, Radcliffe NM. Corneal hysteresis and its relevance to glaucoma. Curr Opin Ophthalmol 2015;26:96-102. Hayes DD, Teng CC, de Moraes CG, Tello C, Liebmann JM, Ritch R, et al. Corneal hysteresis and beta-zone parapapillary atrophy. Am J Ophthalmol 2012;153:358-620. Wells AP, Garway-Heath DF, Poostchi A, Wong T, Chan KC, Sachdev N, et al. Corneal hysteresis but not corneal thickness correlates with optic nerve surface compliance in glaucoma patients. Invest Ophthalmol Vis Sci 2008;49:3262-8. Bhartiya S, Gadia R, Sethi HS, Panda A. Clinical evaluation of optic nerve head in glaucoma. J Curr Glau Prac 2010;4:115-32. Allingham RR, Damji KF, Freeman S. Shields' Textbook of glaucoma. 6th ed. Philadelphia USA: Wolters Kluwer/Lippincott Williams and Wilkins; 2012. Harizman N, Oliveira C, Chiang A, Tello C, Marmor M, Ritch R, et al. The ISNT rule and differentiation of normal from glaucomatous eyes. Arch Ophthalmol 2006;124:1579-83. Hwang YH, Kim YY. Application of the ISNT rule to neuroretinal rim thickness determined using cirrus HD optical coherence tomography. J Glaucoma 2015;24:503-7. American Academy of Ophthalmology. Clinical evaluation. Glaucoma: Basic and Clinical Science Course. Sec. 10. USA: American Academy of Ophthalmology; 2014. p. 50. Ferreras A. Glaucoma Imaging. Switzerland: Springer International Publishing; 2016. p. 158-64. Blumenthal EZ, Weinreb RN. Assessment of the retinal nerve fiber layer in clinical trials of glaucoma neuroprotection. Surv Ophthalmol 2001;45 Suppl 3:S305-12. Soliman MA, van Den Berg TJ, Ismaeil AA, De Jong LA, De Smet MD. Retinal nerve fiber layer analysis: Relationship between optical coherence tomography and red-free photography. Am J Ophthalmol 2002;133:187-95. Vazquez LE, Huang LY. RNFL Analysis in the Diagnosis of Glaucoma. Available from: http://www.glaucomatoday.com/2016/06/rnfl-analysis-in-the-diagnosis-of-glaucoma/. [Last accessed on 2017 Jul 27]. Hood DC, Raza AS. On improving the use of OCT imaging for detecting glaucomatous damage. Br J Ophthalmol 2014;98 Suppl 2:ii1-9. Sayed MS, Margolis M, Lee RK. Green disease in optical coherence tomography diagnosis of glaucoma. Curr Opin Ophthalmol 2017;28:139-53. Medeiros FA, Zangwill LM, Bowd C, Vessani RM, Susanna R Jr., Weinreb RN, et al. Evaluation of retinal nerve fiber layer, optic nerve head, and macular thickness measurements for glaucoma detection using optical coherence tomography. Am J Ophthalmol 2005;139:44-55. Dong ZM, Wollstein G, Schuman JS. Clinical utility of optical coherence tomography in glaucoma. Invest Ophthalmol Vis Sci 2016;57:OCT556-67. De Moraes CG, Hood DC, Thenappan A, Girkin CA, Medeiros FA, Weinreb RN, et al. 24-2 visual fields miss central defects shown on 10-2 tests in glaucoma suspects, ocular hypertensives, and early glaucoma. Ophthalmology 2017;124:1449-56. Traynis I, De Moraes CG, Raza AS, Liebmann JM, Ritch R, Hood DC, et al. Prevalence and nature of early glaucomatous defects in the central 10° of the visual field. JAMA Ophthalmol 2014;132:291-7. Hood DC, Raza AS, de Moraes CG, Odel JG, Greenstein VC, Liebmann JM, et al. Initial arcuate defects within the central 10 degrees in glaucoma. Invest Ophthalmol Vis Sci 2011;52:940-6. Ahmad SS. Gonioscopy – A primer. US Ophthalmic Rev 2017;10:42-5. Coleman AL, Miglior S. Risk factors for glaucoma onset and progression. Surv Ophthalmol 2008;53 Suppl 1:S3-10. Chaitanya A, Pai VH, Mohapatra AK, Ve RS. Glaucoma and its association with obstructive sleep apnea: A narrative review. Oman J Ophthalmol 2016;9:125-34. Kornmann HL, Giaconi JA. Treatment initiation in glaucoma suspects. US Ophthalmic Rev 2014;7:45-9. Galanopoulos A, Goldberg I. Clinical efficacy and neuroprotective effects of brimonidine in the management of glaucoma and ocular hypertension. Clin Ophthalmol 2009;3:117-22. Whittaker K, Shah P. Ocular hypertension. In: Taylor RH, Shah P, Murray PI, Burdon A, editors. Key Topics in Ophthalmology. 2nd ed. UK: BIOS Scientific Publishers; 2001. p. 200. Jampel HD, Frick KD, Janz NK, Wren PA, Musch DC, Rimal R, et al. Depression and mood indicators in newly diagnosed glaucoma patients. Am J Ophthalmol 2007;144:238-44.